Welcome to another Feminist Friday! Our weekly special where we depart from our regular programming and instead share a handful of feminist videos we are crushing on big-time. It’s part of our overall mission to share meaningful portrayals of feminism, especially those that are intersectional. This week we’ve got quite the intersectional mix, with a web series, a short film, and a documentary following female artists in the world of Electronic Dance Music. ‘The Foxy Five’ is an intersectional feminist web series which was first released in 2016 and just concluded the season a few months ago. It was created by 23 year-old filmmaker Jabu Nadia Newman who is based in Cape Town, South Africa. Her mission was to challenge the dominant representation of black African women, according to feature on iD.vice.com. As the title suggests, the central story follows five women – Womxn We, Blaq Beauty, Unity Bond, Femme Fatale, and Prolly Plebs – as they navigate truths and myths that contribute to typical narratives about black womanhood. Jabu wrote the series while she was studying politics at University of Cape Town, and was inspired by various political movements that South Africa has witnessed, as well as portrayals of black women in 70’s-era movies such as ‘Foxy Brown’ and ‘Shaft’. 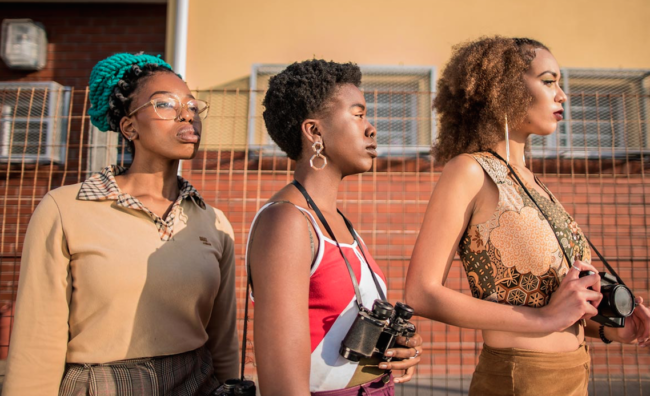 Along with South African political movements, Jabu was also inspired by American feminist icons and movements such as Gloria Steinem, Maya Angelou and the Black Panthers. This series was her contribution to the current landscape of previously marginalized and stereotyped voices now having the opportunity to create great content. Thai designer Mook Attakanwong has released a series of videos for her new collection and instead of going down the usual route with most fashion campaigns, she has focused on female empowerment by profiling a handful of women who are dancers, artists, photographers, coders and philanthropists between them. Dubbed the “Attagang”, Mook teamed up with film director and photographer Vijchika Udomsrianan, who initially suggested the idea of using real women in the short film, instead of models. “I wanted to create something that was extremely aesthetically pleasing and fashion oriented but also had a strong message behind it. We wanted to create something to inspire women of all ages and evoke an ‘inner calling’ within them by showing that women can be talented, beautiful and strong at the same time,” Mook told Teen Vogue. Mook chose each of the women who she personally knows, as they had inspired her in different ways since she moved to New York 3 years ago. By doing this she also says it was her way of ensuring more diverse representations of women are shown in fashion, as it is an industry that is crying out for this. “Diversity in casting and representation in fashion is something that is very near and dear to my heart as a woman of color and a minority. Although there is an improvement in casting on the runway, we still have a very long way to go. Thus, it was important for us to not only cast talented women but also show that talent and beauty exist in all races, ages, sizes and cultures,” she said. The final video this week is a trailer for the feature length documentary “Amplify Her”, directed by Canadian filmmakers Ian Mackenzie and Nicole Sorochan. It follows 3 female artists within the EDM genre, and in an interview with TimesColonist.com, Nicole says this is not just a film about the lack of gender equality in the industry. “Instead of asking: ‘Why aren’t there more women [in this industry]?’ which is polarizing, let’s celebrate what unique expressions there are that women offer,” she said. The film was five years in the making, and is centered around music producer Blondtron, and artists AppleCat (a single mother who encourages listeners to release their “sexual shame”) and Lux Moderna (who was diagnosed with Lyme Disease and uses her music to channel her frustration). Along with the documentary, a seven-chapter graphic novel and an expanded motion comic series about female empowerment will also be released as the digital component to ‘Amplify Her’. With compelling personal stories, the film showcases the women battling their own demons while trying to conquer the international festival circuit. There are also a number of other female artists from across North American featured in the film. “It’s definitely more than just a film,” said Nicole, who hopes many audiences see this film, a labor of love and hard work for her. We certainly need to see more stories about women in mainstream media and entertainment, so we want to encourage people to go see this film and support independent filmmakers.